Do you think that robots in the future will, in fact, lead an uprising and enslave humanity? Home 2018 June 7 Do you think that robots in the future will, in fact, lead an uprising and enslave humanity? My name is Stephanie Garcia and I am a sophomore at Oakland Unity High School. In my English class, we have been discussing robotics and how advanced technology would affect the future. We are discussing if advanced technology would either lead to the uprising of humanity or to the enslaving of humanity. In my opinion, advanced would try to save humanity without really thinking about it, but fail which would lead them to seem that they are enslaving humanity. 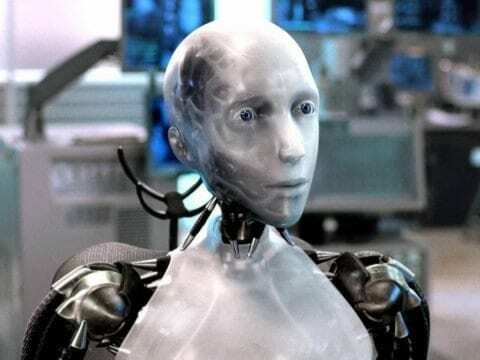 In the movie “I, Robot” by Alex Proyas is a very good example of what I think would happen. In the movie, robots were created to help humanity and make it easier for them. In the company that created them, there was a virtual intelligence named V.I.C.K.Y that started to get smarter over time and started to create a robot army to “save” the humans. In the movie, factories were completely controlled by robots that would make things and themselves. So, V.I.C.K.Y would control the factories to create robots that would not follow the three laws, because V.I.C.K.Y was controlling them. In her mind since doesn’t have the form of feelings she thought it was okay to sacrifice innocent people to save the rest. At the end V.I.C.K.Y did try to save humanity because it made sense in what she was thought was ¨correct”, but in reality, she was doing more harm than she thought. There has been a real-life scenario where AI (artificial intelligence) has evolved by themselves. They started to evolve by starting to create their own language and started to communicate amongst themselves. For this reason, I think that robots will try to help but end up enslaving humans and creating more damage than thought. If you really think about it, in reality, we do not understand their own intelligence. If we don’t understand it then we do not know what they are capable of doing, and when we do it might be too late. Another reason how robots can end up enslaving humans can be found in “Autonomous Weapons Take Warfare To A New Domain, Without Humans” by Ari Shapiro who is an interviewer. In the Interview, there is a conversation about robots making a choice that was about killing a girl in a war in Afghanistan. The little girl was looking at their potions to inform Taliban fighters. The autonomous weapon was programmed to fulfill the laws that are right and legal. The weapon was about to kill the little girl, but the soldiers interfered and made it not kill the girl. The girl was just a little girl that was probably told to do that to stay alive. The soldiers are human and have emotions, in which the autonomous weapon doesn’t. If robots like autonomous weapons don’t have feelings like the humans they will be able to do things without understanding that it will really hurt innocent people. Although it is in their programming, robots can also be unpredictable about how they will process information. Do you think that robots in the future will, in fact, lead an uprising and enslave humanity? by Stephanie is licensed under a Creative Commons Attribution-ShareAlike 4.0 International License.